Hand printed plates of famous Manga artists welcomes visitors at the main entrance of Manga Museum. 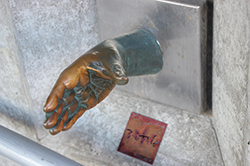 After passing through “Hands that create Manga,” and walking into the Museum, is a bronze colored hand of Manga Artist, Ishinomori. 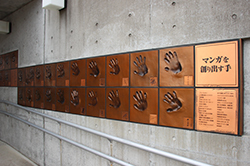 This hand is a very lucky hand since it was not affected by debris or tsunami washing into the Museum on the account of the Great East Japan Earthquake in 2011. 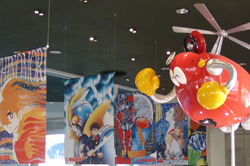 When visiting Manga Museum, please come and shake hands with Ishinomori’s lucky hand. 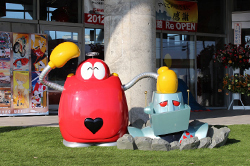 Robocon and Dr. Gantz welcoming visitors on the turf in front of the museum were partly destroyed by the tsunami in 2011, but with the reopening of the museum, they came back to the museum fully repaired to welcome visitors. They did, though, take a step further out from the museum to greet and interact with more and more people. Every 15 minutes ‘Propeller Gururun’ and an airborne ‘Robocon’ will entertain visitors with music and talk. 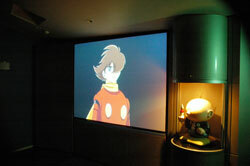 A step into the museum and you will enter a red interior, based on the concept of Ishinomori’s lifework, “Cyborg 009.” Attendants will also greet you, dressed in Cyborg 009 suits. 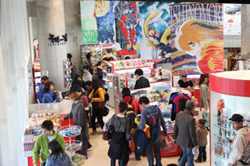 Further into the museum is a souvenir shop, “Bokuju Itteki,” where you can shop for original items available only at the museum. 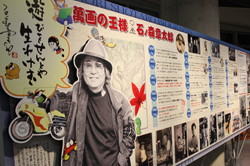 Ishinomori videography corner is a newly opened area where visitors can view Ishinomori’s work chronology, video contents and a one-fifteenth scale model of Tokiwa-so apartment, where Ishinomori spent his youth. Step further into the museum up the slope from the first floor and there is a movie theater playing original animated features. Here at the theater, visitors can enjoy ‘Ryujinnuma (Dragon Lake),’ ‘Kieta Akazukin-chan (The Disappearance of Little Red Riding Hood)’ every 10 and 40 minutes past the hour, and ‘Seajetter Kaito,’ a 14 minute original movie created by the Kamen Rider production staff with a star-studded cast, every 30 minutes past the hour. Showtime schedules and contents may change depending on circumstances. Please ask the staff for further information. 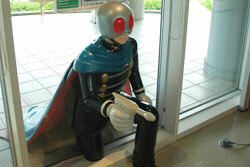 Slipping through the glass of the first floor is “Skullman,” an Ishinomori character, the original model of Kamen Rider.